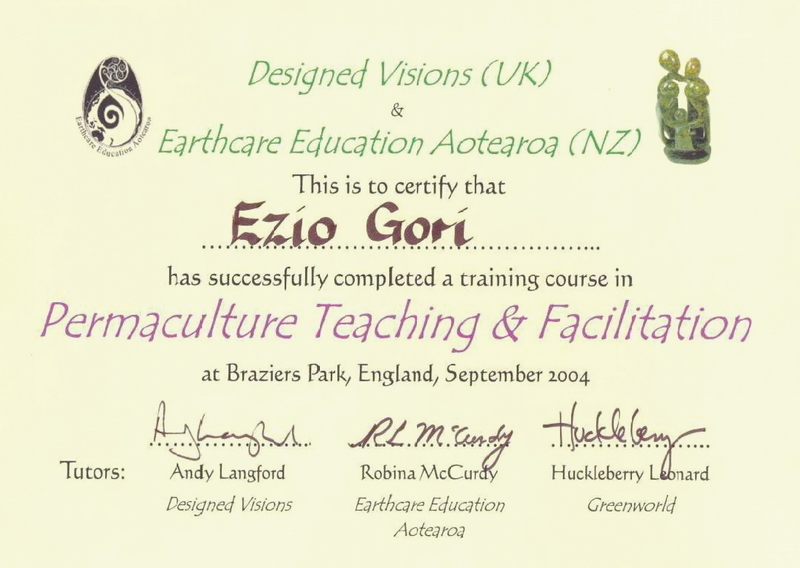 The PermacultureLearning Pathway creates a timeline for specific training courses I have attended and various Permaculture contributions. This journey commenced by reading Permaculture 1 by Bill Mollison and the Magic of Findhorn by Paul Hawkin. The attendance of the PDC at Findhorn provided an excellent grounding to plan Permaculture projects, both small and large scale. for human settlements in my development type projects. This is Mamma Gori’s small Permaculture home garden established to provide vegetables, herbs and some fruits for her family and friends. This was a planning project for a 3,5 ha tract of land, which was previously an Apartheid era buffer strip, but is now zoned for agriculture. Some 50 allotments of 400 m2 each were proposed together with a Farmers Support Centre and 500 homestead gardens within the surrounding communities. design principles can enhance the sustainability of human settlements. The network with Earth Mother Organics resulted in a reciprocal beneficiation wherein many small scale farmers were brought to visit the Earth Mother homestead in Assagay, Durban, in order to appreciate a flourishing Permaculture garden that provided much food security, whilst in return, I assisted Earth Mother Organics to prepare a business plan for their first shop in Hillcrest. Development who at the time were very keen to develop the organics industry in the Province of KwaZulu-Natal. (SGGs) for some 286 small scale farmers covering a total area of some 135 ha. 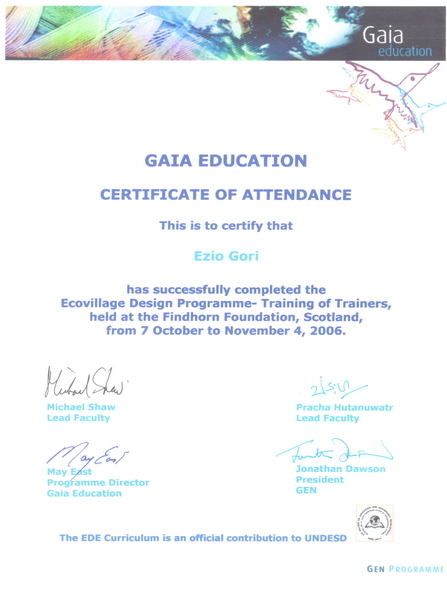 United Nations endorsed training course that has been developed by GAIA Education (www.gaiaeducation.org). (Click here for EDE certificate). demonstrate and teach to the nearby First and Third World communities the essentials of sustainable development. This presentation was made usually following the showing of the DVD "The Power of Community – How Cuba Survived Peak Oil". The presentation included a slide show of the Cuba cycle experience and the relevance to Climate Change and Peak Oil. Several of these presentations have been made. This visit to Findhorn debated and workshopped the strategies required to mitigate against Climate Change and Peak Oil and provided a fertile ground to develop further ideas for sustainable development and planetary survival. Strategic Planning Workshop held in mid-July 2009, also resulted in a call up by the Cedara Agricultural College to assist with the re-establishment of their Food Security Unit. This entailed the presentation of a few lectures and the preparation of a Permaculture design framework for the 1ha food security site. This tutorial with my Permaculture supervisor, Hannah Thorogood, reviewed my Permaculture experience and provided much enthusiasm towards compiling my Permaculture webpage. 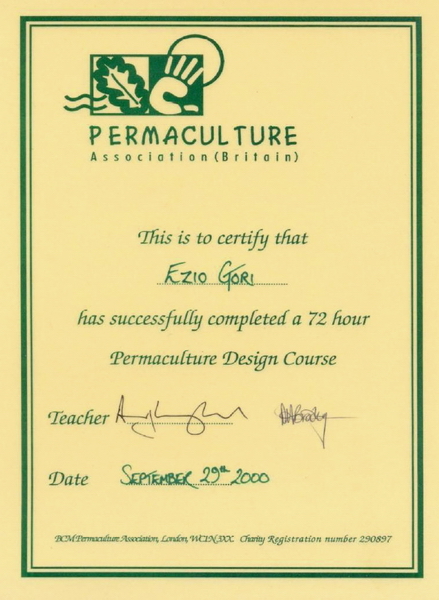 and provided invaluable advice into how to prepare for my Permaculture presentation for the diploma accreditation.